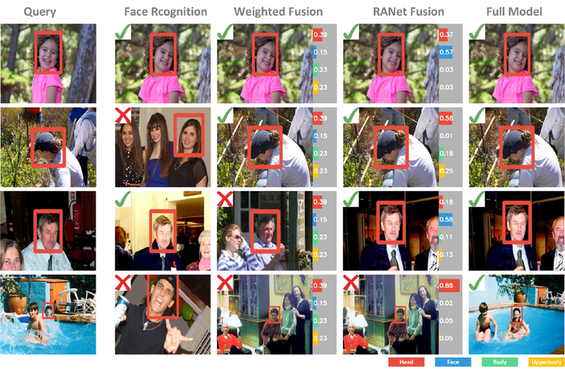 Despite the great success of face recognition techniques, recognizing persons under unconstrained settings remains challenging. Issues like profile views, unfavorable lighting, and occlusions can cause substantial difficulties. Previous works have attempted to tackle this problem by exploiting the context, e.g. clothes and social relations. While showing promising improvement, they are usually limited in two important aspects, relying on simple heuristics to combine different cues and separating the construction of context from people identities. In this work, we aim to move beyond such limitations and propose a new framework to leverage context for person recognition. In particular, we propose a Region Attention Network, which is learned to adaptively combine visual cues with instance-dependent weights. We also develop a unified formulation, where the social contexts are learned along with the reasoning of people identities. 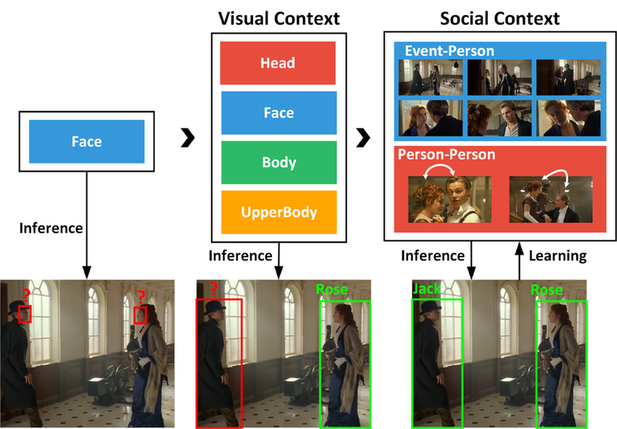 These models substantially improve the robustness when working with the complex contextual relations in unconstrained environments. On two large datasets, PIPA and Cast In Movies (CIM), a new dataset proposed in this work, our method consistently achieves state-of-the-art performance under multiple evaluation policies. 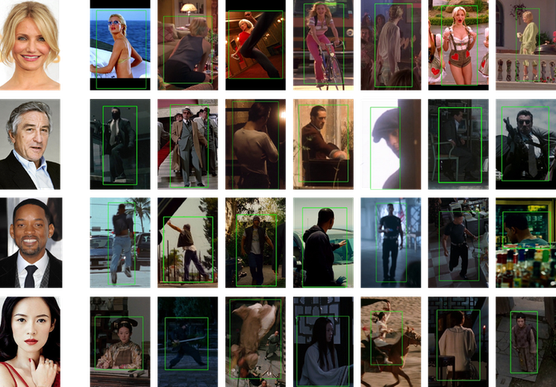 Cast In Movies (CIM) contains more than 150K instances of 1,218 cast from 192 movies. Bounding box and indentity of each instance are manually annotated. We will release CIM after the deadline of WIDER Challenge since CIM has been used for the "Person Search" track of the challenge.